Electric Mirror Savvy SmartMirror (prices vary; find out more at electricmirror.com/savvy). Everett-based Electric Mirror has made smart mirrors for high-end hotels for a few years, and now is offering the line to home customers. The mirrors can be loaded with apps from the Google Play store and can be used as a touch screen or with voice assistance. Motion sensors, integrated speakers, screen casting and optional integrated LED lighting make this the smart mirror to beat. Electric Mirror first rolled out tech-infused mirrors for the hotel industry – now there’s a new market. If Snow White’s stepmother had owned a Smart Mirror, she might have been more chill. Instead of fretting over who’s the fairest, she could have watched a TED Talk or put the Pharrell Williams song “Happy” on repeat. This mirror causes a sensation in the fairs of hotel equipment where it goes. In truth, the Savvy Smart Mirror is much more than a mirror. 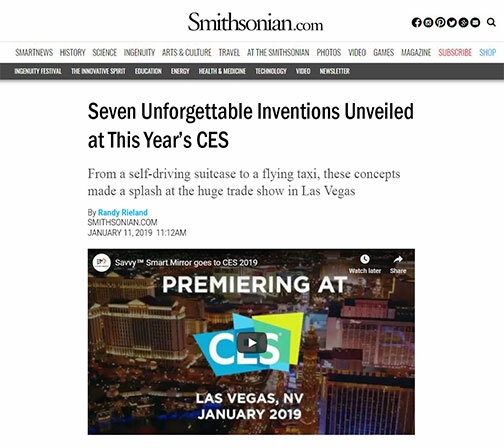 At Consumer Electronics Shows in Las Vegas, it did not go unnoticed and became one of the technological trends of the moment. 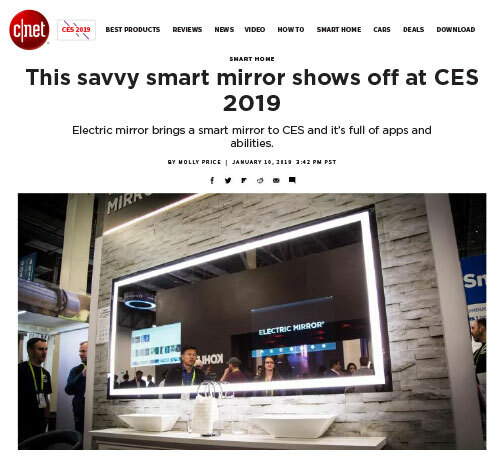 From Black Mirror to … Savvy Mirror: the mirror of the future comes to the present day thanks to Electric Mirror, who presented his solution at CES in Las Vegas. 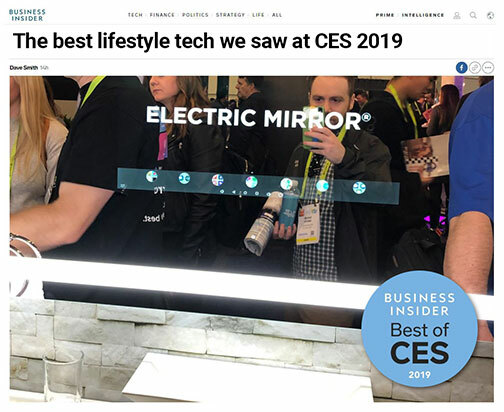 The Savvy by Electric Mirror is one of the more impressive showings at CES 2019, and playing around with it will make you feel like the future has finally arrived. We’ve seen smart mirrors around CES 2019, but the Savvy Mirror from Electric Mirror takes the cake for size and pricing. Savvy Mirror is essentially a giant Android device on top of a mirror. The dual vanity model I checked out has a screen above each sink. From there, you can add apps from the Google Play store, including your preferred voice assistant for information and assistance. Every January more than 180,000 people show up at the Consumer Electronics Show (CES) in Las Vegas to stroll around in a Future World. LAS VEGAS – Mirrors are perhaps the most underrated part of any home. We use them all the time, primarily as feedback mechanisms: to know if we’ve done a good job brushing our teeth, or brushing our hair, or picking our outfit for the day. Hospitality-grade smart mirror technology now available to the residential market. Electric Mirror is set to debut the Savvy Home SmartMirror, the residential counterpart to its hospitality smart mirror, at CEDIA Expo. With Savvy, consumers can check the time, the weather, and the traffic; review their email, their schedule, and their account balances; get updates on the news, their friends and their health; enjoy their favorite music, movies, and sports; and even control their lights, their thermostat, and their security system. Electric Mirror, specialist in smart mirror technology, will ship its first large order of the Savvy SmartMirror this autumn. Over 150 Savvy SmartMirrors will be installed in guest room bathrooms in the upscale new Sinclair Hotel in Fort Worth, Texas. (June 6, 2016) — Jim Mischel, President and CEO, Electric Mirror interviewed by Alissa Ponchione, Associate Editor at Hospitality Design Magazine- Electric Mirror is the global leader in lighted mirror and mirror TV technology. Daily News Los Angeles – Electric Mirror Nationally Honored With President’s Export Award. (May 24, 2016) – Electric Mirror (www.electricmirror.com), the premier manufacturer of lighted mirrors and mirror TVs and the global leader in mirror technology, announced today it has received the President’s “E” Award for Exports by U.S. Secretary of Commerce Penny Pritzker at an awards ceremony in Washington, D.C.
Wall Street Select – Electric Mirror Opens New 125,000-Square-Foot Global HQ and Production Facility to Meet Growing Demand. (May 24, 2016) – Family-owned company relocates to increase production, reduce lead times, launch new proprietary Cameo Designs product, and better serve its customers. 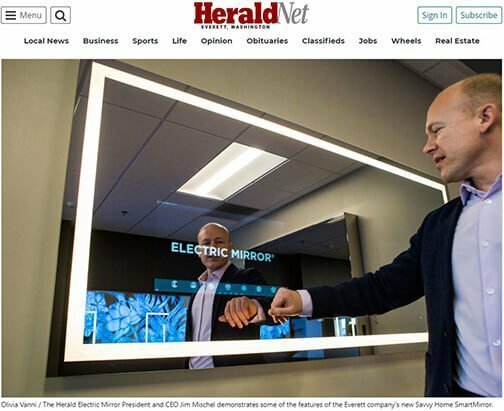 Herald Business Journal – A computer in your mirror? Electric Mirror® sees sales rise on hot demand. (May 14, 2016) Behind the reflection of mirrors, all kinds of technology can be hidden. This is the basic premise of Electric Mirror LLC, an Everett company that has been riding demand for its high-technology mirrors to sales growth expected to be 40 percent to 50 percent this year, after 50 percent growth last year. Electric Mirror earns 45th patent, securing exclusive use of wireless enabled content delivery system. EVERETT, WA (August 21, 2017) – Electric Mirror (electricmirror.com), the global leader in mirror technology, announced today it has been awarded a patent from the United States Patent and Trademark Office that safeguards the company’s innovative solution for streaming audio and video. 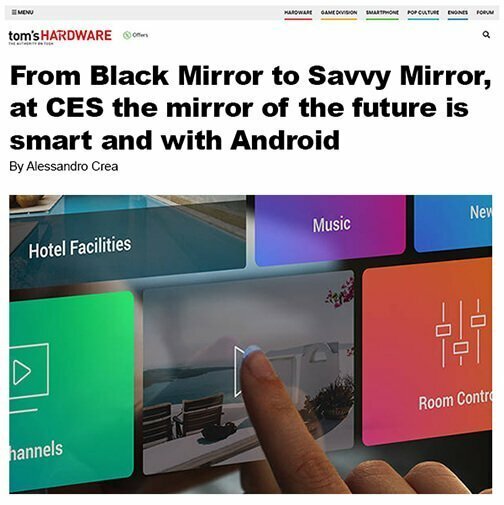 Electric Mirror revolutionizes hotel guest experience with launch of Sage, the world’s first voice-controlled mirror for the hotel industry. EVERETT, WA (August 15, 2017) – Electric Mirror (electricmirror.com), the global leader in mirror technology, introduces Sage, a new voice-controlled mirror available for specification in the global hospitality market beginning Fall, 2017. Electric Mirror ushers in hotel room of the future with new Savvy smart mirror. 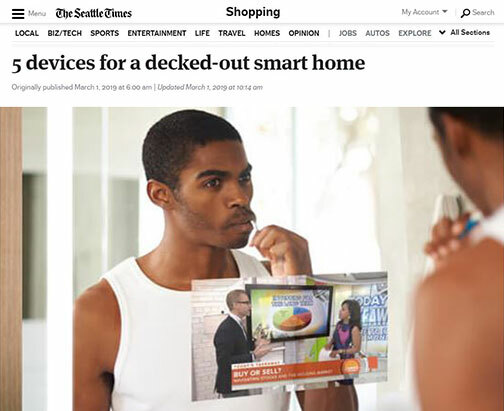 EVERETT, WA (May 1, 2017) – Electric Mirror (www.electricmirror.com), the global leader in mirror technology, introduces Savvy, the world’s smartest mirror. The Savvy SmartMirror™ is available for specification in the global hospitality market beginning Fall 2017. Electric Mirror launches Ava, the perfect mirror for makeup application. EVERETT, WA (May 1, 2017) – Electric Mirror (www.electricmirror.com), the global leader in mirror technology, introduces Ava, a new lighted mirror designed to help women perfect their makeup application. Featuring Smartlook™ technology, Ava™ allows women to change the lighted mirror’s light color to closely match the environment they’re about to encounter, making precise makeup application possible. Electric Mirror announces winners of 2016 Cameo Laser Design Contest. EVERETT, WA (December 30, 2016) — Electric Mirror (electricmirror.com), the global leader in mirror technology, announced today the winners of its 2016 Cameo™ Laser Design Contest. Cameo Laser Designs is a patent-pending process that uses proprietary laser technology to etch decorative patterns into the lighted areas of the mirror surface, creating unique and luxurious lighted mirrors. Electric Mirror launches major contest to solicit designs for its lighted mirrors. EVERETT, WA (November 9, 2016) — Electric Mirror, the global leader in mirror technology, announced today it is launching a world-wide contest to solicit Cameo™ Laser Designs for its lighted mirrors. Cameo is a patent-pending process that uses proprietary laser technology to etch decorative patterns into the lighted areas of the mirror surface, creating unique and luxurious lighted mirrors. EVERETT, WA (August 2, 2016) — Electric Mirror, the global leader in mirror technology, unveiled the next generation of its patented and energy-savings Keen™ Technology, which offers improved functionality and is now available at a lower cost. EVERETT, WA (July 6, 2016) – Electric Mirror, the premier manufacturer of lighted mirrors and mirror TVs and the global leader in mirror technology, announced today it has been awarded a patent from the United States Patent and Trademark Office that safeguards the company’s method for manufacturing lighted mirrors. The company’s 42nd patent protects the company’s right to solely utilize this American-made technology. Everett, WA — (June 6, 2016) – – Electric Mirror®, the global leader in lighted mirrors and mirror TV technology, reinforced its reputation as the industry’s innovation leader by unveiling a collection of ingenious new products at HD Expo 2016 in Las Vegas. 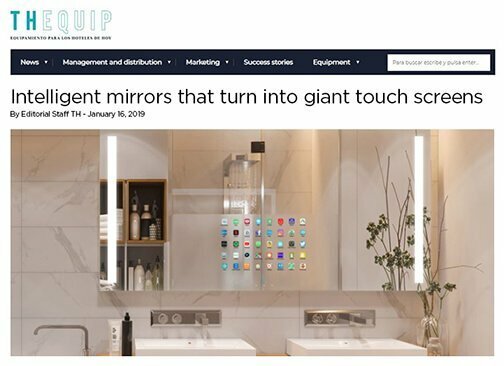 “These products will change how and what you think about mirrors and TVs,” said Jim Mischel, President and CEO of Electric Mirror, during a filmed interview with Hospitality Design Magazine’s Alissa Ponchione. EVERETT, Wash. (May 23, 2016) Electric Mirror (www.electricmirror.com), the premier manufacturer of lighted mirrors and mirror TVs and the global leader in mirror technology, announced today it has received the President’s “E” Award for Exports by U.S. Secretary of Commerce Penny Pritzker at an awards ceremony in Washington, D.C. The “E” Award is the highest recognition that any U.S. entity may receive for making a significant contribution to the expansion of U.S. exports. (Everett, Wash.) Electric Mirror opens new 125,000-square foot Global Headquarters and Production Facility to meet growing demand for mirror products. Family-owned company relocates to increase production, reduce lead times, launch new proprietary Cameo Designs Product, and better serve its customers. (Everett, Wash.) Electric Mirror, the premier manufacturer of Lighted Mirrors and Mirror TVs and the global leader in mirror technology, announced today the award of their 40th patent from the United States Patent and Trademark Office. The patent safeguards their vanishing Mirror TV innovation and protects Electric Mirror’s right to solely produce the technology. (Everett, Wash.) Electric Mirror, the premier U.S. manufacturer of Lighted Mirrors and Mirror TVs and the global leader in Mirror Technology, announced today that the company has hired Jack Armstrong as the National Healthcare and Senior Living Sales Manager. (Everett, Wash.) Electric Mirror proudly presents the Genesis Duo Hospitality TV, a two-piece LED Ultra-thin HDTV television system that offers multiple benefits making installs, upgrades, and updates easier to achieve than ever before. (Everett, WA) The United States Patent and Trademark Office granted Electric Mirror patent US 8,910,402 B2 for its invention featuring a mirrored medicine cabinet combined with a TV in the door and a mirrored medicine cabinet combined with a lighting system in the door. (Everett, Wash.) The United States Patent and Trademark Office continues to recognize and provide protection for Electric Mirror’s designs, recently issuing a patent (U.S. RE 43,634 E) for its Framed Lighted Mirror TV design. (Everett, WA) – If you are looking to turn unused space in your kitchen into an entertainment center complete with high definition and premium sound, Electric Mirror® has the perfect product for you. The global leader in Mirror TV technology is proud to announce its new Kitchen TV. (Everett, WA) The United States Patent and Trademark Office granted Electric Mirror® patent US 8,835,789 B2 for its invention of Keen™ Technology. Keen™ is an energy-saving, environmentally-friendly technology that can be incorporated into any of Electric Mirror’s Lighted Mirrors. You may have seen them in fancy hotels…an Everett company makes lighted mirrors….that can play your favorite songs…that have a TV embedded in them. They say we’ll ALL have one someday. It’s the mirror of the future now! Behind the reflection of mirrors, all kinds of technology can be hidden. This is the basic premise of Electric Mirror LLC, an Everett company that has been riding demand for its high-technology mirrors to sales growth expected to be 40 percent to 50 percent this year, after 50 percent growth last year. Industry leader Electric Mirror launches Keen™, an intelligent energy-saving dimmable lighting technology with integrated capacitive touch controls. (October 10, 2013 – Seattle, Washington) We have a winner! Steve S. of Matrix Sound and Vision won $1,000 off his next purchase of one of our Mirror TV’s! Congratulations to Steve and all the other participants. Meanwhile we look forward to working with all CEDIA members. Travis Boyd, Electric Mirror’s Residential Inside Manager picked the winner, while Julia Herbert, Electric Mirror Executive Assistant made sure he didn’t peek! Electric Mirror is the leader in Mirror TV technology and our products always will make an unforgettable first impression on your guests. (April 28, 2010 – Seattle, WA) Electric Mirror’s Visionary is Best of Boutique and will be shown at the Hospitality Design Boutique 2010 in Miami. This luxury medicine cabinet is part of the Impression Collection designed by Jim Mischel, President and Chief Designer at Electric Mirror. “The Impression Collection is a fusion of design subtelty and modern technology,” says Mr.
(Seattle, WA) Electric Mirror has over 200 employees working to create the best products for your needs. We are the biggest in the industry and you can be confident that we have top-quality employees walking you through the entire process of selecting, purchasing, and installing our Electric Mirrors. 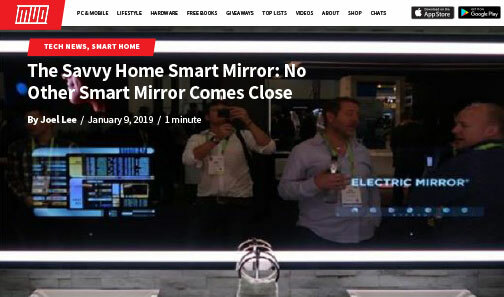 FTFtv Interviewed CEO Jim Mischel at the 2019 CES, as he demonstrates how Savvy Home can control your whole house…with a mirror. Introducing the Poet, our newest innovation. Captivate your guests with our new vanishing message technology. Making its debut at BDNY 2018, The Poet vanishing message mirror is already making a buzz. Learn more at here. Everett Mayor Ray Stephanson recognizes Electric Mirror in the January 2017 State of the City address. Win fame and fortune in Electric Mirror’s Cameo Laser Design contest. CEO Jim Mischel explains how. Enter by November 30 for a chance to win $5,000 cash and be featured at HD Expo, BDNY and BD West. What are Cameo Laser Designs? Electric Mirror Executive Vice President Aaron Mischel describes Cameo Laser Designs. Jim Mischel, President and CEO of Electric Mirror is interviewed by Alissa Ponchione, Associate Editor at Hospitality Design Magazine at HD Expo, where several fantastic new products were unveiled. See them here. We Are Fully Moved In! March 2016 – We are fully moved in! See the operation with time lapse. Shorter Lead Times: In-Stock Products: Immediate Delivery. Standard Sizes and Options: 6 Weeks. Custom: Call for Cost and Lead Time. Electric Mirror, the leader in the Lighted Mirror and Mirror TV industry, introduces Iris®, the next generation of Entertainment Mirror TV. Electric Mirror has 10 Makeup Mirror models to choose from with in wall mounted and countertop versions in three different finishes. Keen™ Technology is an energy-saving, environmentally-friendly Lighted Mirror with a dimming touchpad. Four capacitive touch buttons embedded into the face of the mirror give the user full control over eight light dimming settings, including a Night Light. Offering almost a 60% reduction in energy costs, Keen has an intelligent sensor that allows the mirror to automatically dim after being on for one hour. Watch and enjoy Electric Mirror’s new three minute video that tells the story of how we became the Lighted Mirror and Mirror TV Technology Industry Leader. Electric Mirror continues its industry-leading innovation by introducing Vive™, the first and only Bluetooth® enabled smart ready mirror. Vive is simple and easy to use and transforms any of our products into a wireless stereo system. See the whole interview with Jonathan Tisch here!